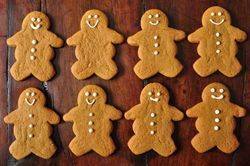 Gingerbread Men: In a large bowl, sift or whisk together the flour, salt, baking soda, and spices. In the bowl of your electric mixer, with the paddle attachment, (or with a hand mixer) beat the butter and sugar until light and fluffy. Add the egg and molasses and beat until well combined. Gradually add the flour mixture beating until incorporated. Divide the dough in half, and wrap each half in plastic wrap and refrigerate until firm (at least two hours or even overnight). On a lightly floured surface, roll out the dough to a thickness of about 1/4 inch. Use a gingerbread cutter to cut out the cookies. With an offset spatula lift the cookies onto the baking sheet, placing about 1 inch (2.5 cm) apart. If you are hanging the cookies or using as gift tags, make a hole at the top of the cookies with a straw or end of a wooden skewer. (If cookies are a little soft, place the baking sheet (with the unbaked cookies) in the fridge for about 10 minutes. This will prevent the cookies from losing their shape.) Bake for about 8 - 12 minutes depending on the size of the cookies. They are done when they are firm and the edges are just beginning to brown. Remove the cookies from the oven and cool on the baking sheet for about 1 minute, then transfer to a wire rack to cool completely. If desired, you can press raisins, currants, or candies into the dough for eyes and buttons while the cookies are still warm. Otherwise, confectioners frosting can be used to decorate the cookies. Store in an airtight container.